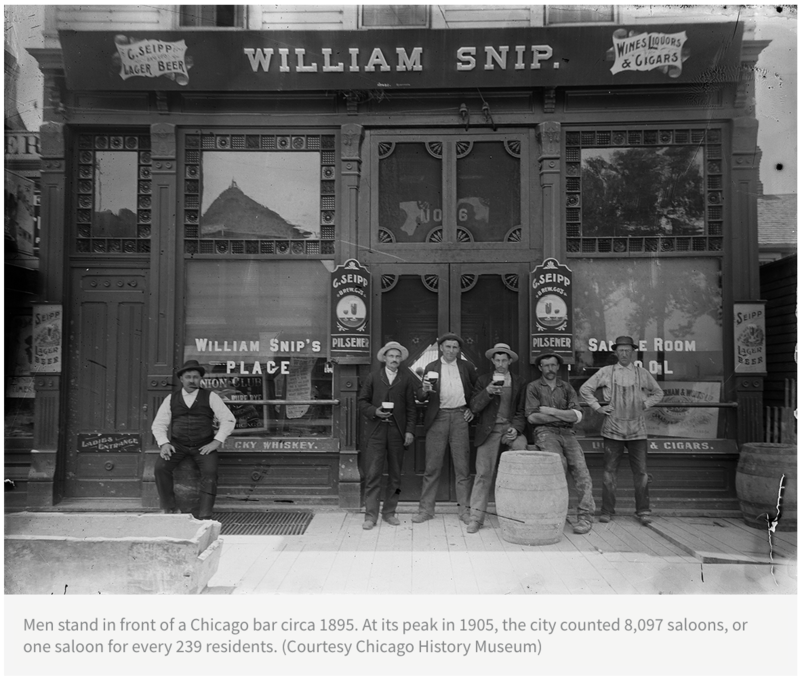 April 6, 2019 - WBEZ's Curious City covers podcast co-creator Patrick McBriarty's question asking what happened to all the corner taverns in Chicago? Read the article or listen to the segment as broadcast on WBEZ. 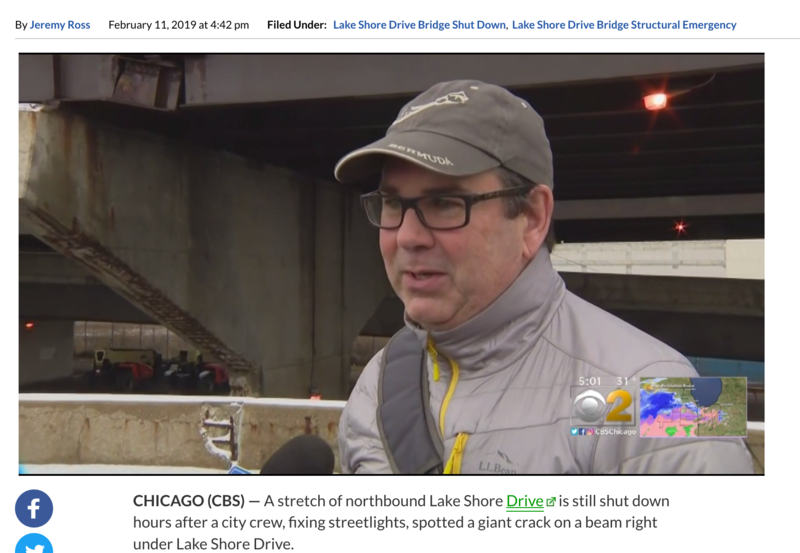 Feb. 11, 2019 - CHICAGO (CBS) reports on a stretch of northbound Lake Shore Drive is still shut down hours after a city crew, fixing streetlights, spotted a giant crack on a beam right under Lake Shore Drive. The Chicago Department of Transportation said there’s just the one crack, but right behind it, CBS 2 found another cracked beam. Motorists would have no idea it was there. 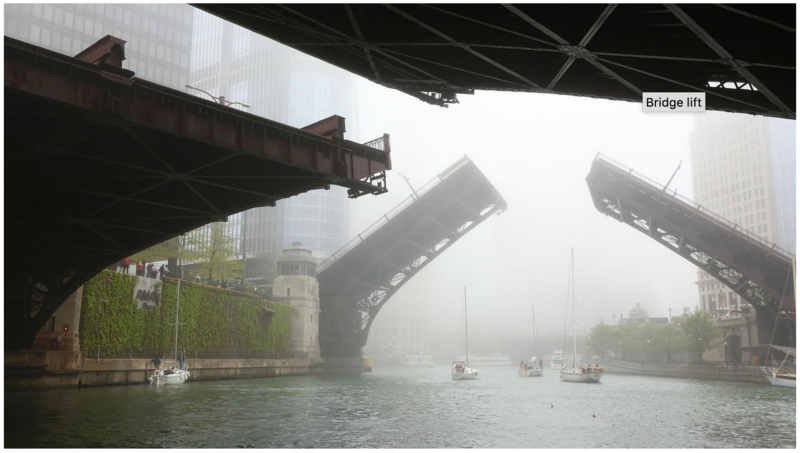 Feb. 4, 2019 - Weakform Magazine article "The Silent Crossing" by Rory Datyon looks at the history and recent demise of the Chicago Avenue Bridge. This fascinating article includes insights explaining Patrick McBriarty's transition from business consultant to author and bridge historian. Oct. 18, 2018 - The Chicago Tribune says Chicago is seeing fewer bridge lifts. Here’s why. by Mary Wisniewski. It’s bridge-lifting season in Chicago — time for one of the few downtown traffic holdups that can inspire a little wonder, instead of aggravation. 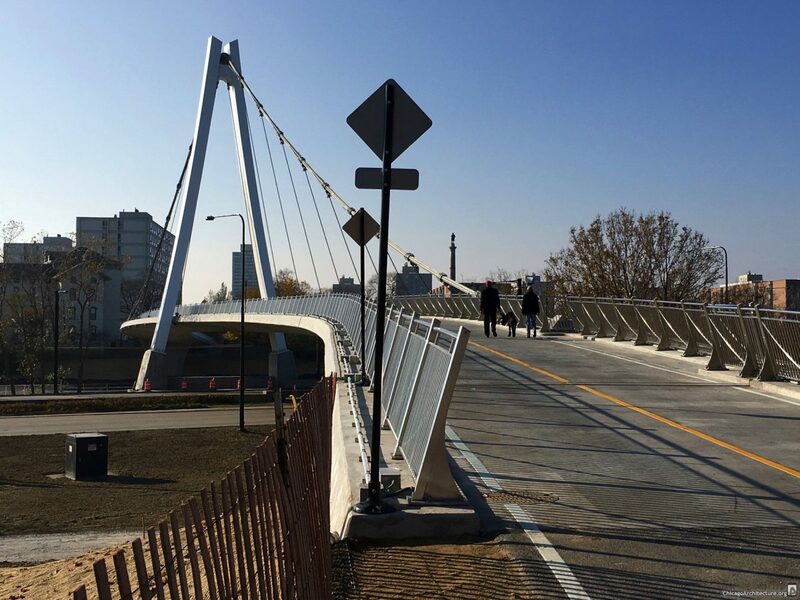 Nov. 28 2016 - article in ChicagoArchitecture.com details new the 35th Street Pedestrian Bridge, which began in July 2014, designed by architect John Hillman and the engineering firm Teng and Associates. The gentle S-curved bridge offers a wide bicycle and pedestrian roadway to and from the lakefront. May 10, 2016 - Patrick McBriarty was interviewed live on Chicago Tonight by host Phil Ponce about the great number 100-year old Chicago drawbridges, as four celebrate their 100th anniversary in 2016. By the end of the year, 24 of Chicago's 60 drawbridges crossing the waterways will be 100 or more years old. Jan. 15, 2016 - Patrick McBriarty was interviewed by reporter Stephanie Fortino for the The St. Ignace News and Mackinac Island Town Crier and this article was published on February 13, 2016 about his January Artist in Residence at Mission Point Resort and experience on Mackinac Island in winter. Dec. 6th, 2015 - John Dempsey on WLS interviewed Patrick McBriarty as part of Connected to Chicago with Bill Cameron (42:12 into the program), which regularly airs on Sunday evenings from 7-8 pm. In this segment John talks with Patrick about his books, Chicago bridges, and his children's picture book series. Nov. 16, 2015 - WYTV ABC 33 host Katie Dugan interviewed author Patrick McBriarty about his illustrated children's books Drawbridges Open and Close and Airplanes Take off and Land while visiting the area. The interview aired Friday morning, November 20. 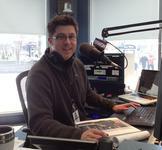 April 26, 2015 - WGN Radio 720 host Mike Stephen interviewed author Patrick McBriarty about Chicago's fantastic bridges, his first book Chicago River Bridges, and latest work creating the PTM Werks Series of illustrated children's books. April 14, 2015 - Chicago Tonight host Phil Ponce interviewed author Patrick McBriarty about his first book Chicago River Bridges on WTTW Chicago Public Television Channel 11. The discussion focuses on the importance of the bridges to Chicago (past and present) in this 10-minute interview. March 10, 2015 - the Chicagoist ran the article “Happy 100th Birthday To The Oldest Vertical Lift Bridge In Chicago” on the Pennsylvania Railroad Bridge in Chinatown lauding its 100-anniversary, which includes several quotes from Patrick McBriarty's research on this bridge. March, 2015 - The Beachwood Reporter ran a nice article about author Patrick McBriarty's then upcoming talk at the Society for Midland Authors on his books and documentary on Chicago's bridges. 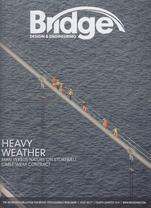 4th Qtr., 2014 - Magazine reviewed Chicago River Bridges and giving the book high praise by this UK engineering magazine’s editor, Helena Russell in Issue No. 77, 4th Qtr 2014, who states, "The best non-fiction books come from authors who have a strong, potentially obsessive passion for their subject matter... the ones that make it into print are a delight: Patrick McBriarty's book in the Chicago River Bridges is no exception." June 29, 2014 - On the WGN Radio 720 After Hours with Rick Kogan, he interviewed Patrick McBriarty to discuss his first book Chicago River Bridges. Listen to this 18-minute interview. May 14, 2014 - Chicago ABC News Reporter Frank Mathie interviewed Patrick McBriarty as part of a segment on the 94th Anniversary of the opening of the Michigan Avenue Bridge. The event was spurred by the McCormick Bridgehouse & Chicago River Museum's celebration of the bridge, which included a bridge lift and birthday cake commemorating the anniversary.